The increasingly crucial role of party leaders in the political process can hardly be contested. 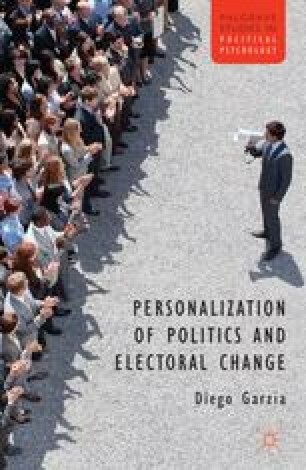 The growing personalization of the political sphere throughout time has resulted in a parallel change in the political supply. In an attempt to adapt to the changing environment, contemporary catch-all parties’ electoral strategies and organizational structures have, in fact, become heavily leader-centered. On the basis of the profound changes occurring in the political supply, it has been hypothesized that individual politicians have become more prominent vis-á-vis parties and collective identities in the mind of voters. However, empirical research has fallen short of a consensus on whether party leaders have actually increased their impact on individual voting behavior, and, in turn, aggregate election outcomes. As repeatedly argued in the previous chapters, the reason for such uncertainty within the available literature is to be found in the ways in which leader effects have been conceptualized and measured — that is, mainly as a function of temporally and causally prior partisan allegiances.